I have just watched episode 1 and I thought it was quite enjoyable. The first part(the food discussion)wasn't very good(it wasn't bad, but it wasn't great), but overall it was very good. I don't know why but some parts(especially the conversations)reminded me of Seinfeld. It seems that they are going with random songs at the karaoke bar for the ending as this week was something entirely different. A day earlier this week? It's the new trend? Random Air time after random episode order? Are you forgetting about the international date line, perhaps? What the hell? Ain't it supposed to air tomorrow? (or tonight if we shift it to Jap standards). Yeah, but still, it's supposed to air at Sunday midnight, and that's tomorrow at noon for us westerners of the American continent. Tomorrow at 8:00am if you're Pacific, 9:00am if you're Mountain, 10:00am if your Central, 11:00am Eastern in the other American continent. ...I agree though. What the heck? Yeah, I forgot I live in a city with an international date line that lands in the middle of the goddamn Atlantic Ocean. It airs at 12 pm here. Well, at least calculating which time is in Japan right now is easy as hell over here. Her hands aren't that clean either. 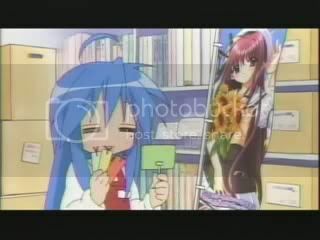 Naughty, naught, Konata-chan. You'll have to stay after school. And put on the bunny suit in the closet. Earlier in this thread, someone posted a pic comparing a location in the OP to a real-life place. I can't find it quickly now, but on iichan someone has posted a couple of others, which I found amusing. Syoboi Calendar still shows the first broadcast of ep2 as Sunday midnight, but some people are posting on 2channel as if they've seen it. An unnamed network shows lots of copies of it...but they are all actually .scr and .exe files, as far as I can tell. A normal phenomenon in that sector, especially with shows that are controversially popular. Nice catches on those RL pic comparisons. Have you tested them first? Sorry. After Kaoru Chujo's post, I don't think I should click on any LuckStarep2 torrents unless I know they are genuine. EDIT: Kaioshin_Tama, I hope you are satisfied now. Your comrades are fighting a war against moe by sending out computer viruses. Is that what you wanted? Yes, the files are OK, but they are in "youtube quality". And is not possible to attach a virus to a flv or another video file. .flv files are Flash files from the Net and will just be low quality, not otherwise dangerous, as far as I know. Those bad ".avi" files never seem to make it to BT. But I guess there's always a first time, lol. Does anyone know how a show that hasn't been broadcast yet shows up on the Net? Inside job? Or has it actually been shown? May I take this one? LOL. 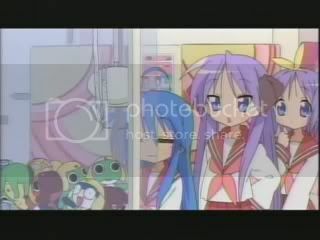 when Konata was playing in the arcade isn't that Marduk and Law? from tekken? the CM revealed: Clannad 9/15 air date. @Kaoru: almost *always* it requires an 'insider' to leak the file before it is broadcast. It may be a low-lvl worker at either the anime studio, the tv network, or a delivery agency who wants to gain cred with their friends... or it could be part of the unique marketing scheme in this particular case.